@readywriting @jovanevery @qui_oui @jessienyc friend on FB called the TT job market the “Hunger Games,” a fight to the death for ONE job. At the end of her post, Kelli Marshall writes: “academia is indeed a racket, and it is flawed on many levels. But I enjoy teaching, and I enjoy publishing (most of the time). And I don’t think I’m willing to surrender just yet, as this “old” PhD still has some things to offer.” I’m not sure that I could say the same. Increasingly, I feel that the academic is more than flawed. It’s broken. And I’m confident that there are other spaces for me to teach and write and engage. So, what does the future of the academy look like? How can they train students to be future leaders and provide them with “access to world-class education”? Get rid of interdisciplinary programs that give students the important skills and tools for learning how to do interdisciplinary work. As I posted in my tweet about this news report: Ugh! Last week, I declared that summer was over. For the past 33 years, since I was 5, the end of summer signaled the beginning of a new school year for me, either as a student or a teacher. But not this year. And I’m relieved. 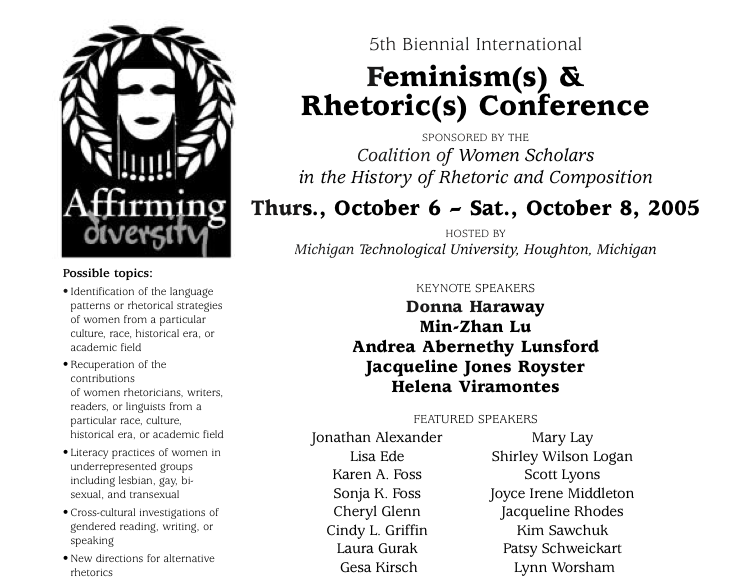 Instead of spending ridiculous amounts of time prepping syllabi and for class discussions (which was usually enjoyable, but too time-consuming for me), I’m hoping to use this fall to create, experiment, explore practices of feminist pedagogy outside of the academy and reflect on how and why I am currently having a serious crisis of faith in higher/institutionalized education. I’m also hoping to continue working on a project that involves bringing together various accounts/stories of my experiences making, being in and staying in trouble. Much of these accounts already exist, in various forms, online. Now, I’m trying to figure out the best way to bring them together. Part of this project is the tracing of my intellectual history for the past 16 years (from graduate school and beyond) and how my experiences engaging with feminist and queer theories, inside and outside of academic spaces, has resulted in feeling trouble and troubled in the academy. One key theme in my intellectual history has been a persistent desire to use the theories and ideas that I was learning to understand, connect, care for/about the world and to heal. This desire was influenced and shaped by my increased exposure in graduate school to feminist thinkers/theorists, like bell hooks, Cynthia Enloe, Dorothy Allison, Patricia Hill Collins, Gloria Anzaldúa, Trinh T. Minh-ha, Judith Butler and Audre Lorde, just to name a few. But even as I was being exposed to these powerful ideas about using theory to understand/connect/care/heal in graduate school, I was being trained to engage with and express these ideas (and others, especially in philosophy courses) using alienating academic jargon and methods. The “rigor” I was learning made it harder for me to talk to and connect with my family and friends. And, the emphasis placed on being critical (that is, critical as picking apart and always finding fault with ideas and thinkers) made it increasingly difficult to find my own voice and make sense of my own experiences. As I struggled with my university’s emphasis on a narrow sense of rigor and their increasing demands for a particular type of professional development, I looked for ways to engage beside (or outside of/in spite of) my graduate training. In 2001 I decided to create a video (with a lot of help from STA) about my family’s farm in the upper peninsula of Michigan. I wanted to document my family’s experiences being (visiting, resting, working) at the farm. And I wanted to use theories on identity, belonging, space, and narrative selfhood that I was wrestling with in my feminist theory classes to make sense of and/or trouble those experiences. I was hoping that my documentary would enable me to share some of what I was doing in my PhD program with my family and would help me to make sense of my own conflicting feelings about belonging, heritage and identity. I loved creating this documentary. So much so that STA and I created another the following year. These two videos are the most important intellectual projects that came out of my years as a PhD student. While hardly anyone will read my dissertation or remember what it was about—even though I liked writing it, I have trouble remember it’s title, generations of family members will be able to watch the farm films and learn about the farm (sold in 2004) and hear my mom’s stories (died in 2009). The importance of these films, especially the second one which was dedicated to my mom, became even more evident as my mom was dying and after her death. People who hadn’t met her before her illness (like her hospice social worker) could/can watch the video and bear witness to her feisty spirit and passion for storytelling. Documenting the farm has been on my mind a lot lately. This past month, I created a series of digital stories about my dad’s experiences living and working on the farm. And this fall, I’m hoping to create another series of stories in which I reflect on my disconnection with the farm (since it was sold) and my family (since my mom died). As I experiment with how to document (on this blog and in digital story form) my relationship to the Puotinen family farm and it’s relevance to my intellectual history, I thought I’d try to post a few related documents from my past. The following two documents speak to my efforts to take the highly personal work of my film projects and make it “appropriate” for academic audiences by grounding it in academic ideas, theories and methods. Drawing upon a wide range of theorists, including bell hooks, Trinh T. Minh-ha and Cathy Caruth, two sisters reflect on the value of physical space and the impact of its loss on representations, constructions and understandings of identity. This session will be divided into two sections. In the first section, Sara L. Puotinen will show extended clips from her two documentaries on the Puotinen family farmstead located on eighty acres of land in Amasa in the Upper Peninsula of Michigan. These two documentaries represent the filmmaker’s attempt to explore the stories of the farmstead—its land, buildings and past and present inhabitants—and how those stories have shaped her understandings of self, family and heritage. In the second section, the filmmaker’s sister, Anne Puotinen, will briefly respond to the films. In addition to critically reflecting on how these films communicate the importance of the farm for the Puotinen family and its individual members, she will discuss how the recent loss of the farm—it was sold in November 2004—affects understandings of physical space in relation to memory and belonging. Last week, Gary A. Olson wrote an article for the Chronicle of Higher Education in which he strongly cautions against jettisoning “traditional monograph-style dissertations” in favor of digital scholarship. Claiming to have “received calls from a handful of deans and department chairs” who fear the damage to the reputation and careers of those in the humanities that such a shift would cause, Olson suggests that digital scholarship might not be scholarship at all. It’s too quick and short. It discourages our capacity for deep concentration and sustained engagement with research. It is not “appropriately vetted by responsible experts.” And, it seems to be (at least partially) motivated by a scholar’s desire to get “instant gratification” from others on their research. In contrast, continuing to rely on the 300+ page dissertation enables scholars to maintain “proper” standards and still be rigorous in their efforts, both of which are central to ensuring that the humanities are valued in this scary time of increased budget cuts. It also enables those in the hollowed halls of higher ed to use the peer review process to keep out the riffraff, “the amateur or dilettante simply posting thoughts online.” Because without the elaborate peer review process of “top tier written journals,” presumably first introduced to grad students through the process of writing and getting their dissertation approved by a committee of experts in their field, written work is (probably) not serious and scholarly enough. Judging by the title of my post and the content of my blog, you might correctly guess that I am troubled by Olson claims. And I’m not alone. Just read the comments on his original piece. Or check out Sample Reality’s response post, Serial Concentration is Deep Concentration, over on his blog. Many writers have great, very thoughtful and studied, responses to why Olson’s argument is faulty. I’m not interested in re-hashing them. Instead, I want to offer up some praise for (what Olson might refer to as) the academic riffraff; those scholars, thinkers, writers, teachers, and activists who refuse to settle for the limited and biased set of standards and proper behavior that many in the academy continue to promote. While these “standards” are supposed to ensure quality, they are often used to keep out ideas/practices/people that challenge privileged forms of knowledge production. Does this mean that we shouldn’t have any standards? That there’s no way to effectively assess whether or not serious engagement is occurring? No. It means that academics need to spend less time policing the borders of who counts as a scholar and more time engaged in the difficult labor of repeatedly asking who benefits (and at whose expense) when “standards” and rigor are invoked. They also need to develop new ways to understand, engage with and evaluate research. Many of the digital scholars that are critical of Olson’s claims aren’t part of the academic riffraff; they are successful academics who have managed to do critical and creative work online and offline in ways that earn them cultural capital within the academy. Indeed, it seems as blogging and other online engagements, have increased caché in the academy, or at least some pockets of the academy. So, my praise of the academic riffraff is not necessarily for digital scholars working within many academic spaces (although I do appreciate the work that they do). Instead, my praise is for all the thinkers, troublemakers, storytellers, academic rebels, adjuncts, graduate student teachers (and more) that get exploited, undervalued, dismissed, and rejected even as they engage in exciting, compelling, innovative, “cutting-edge,” transformative, revolutionary, and accessible work. Not as a side note, but as an finished thought and feeling, I’m bothered by how this argument for “standards” and “rigor” is so easily gendered, raced and classed. It seems that the “academic riffraff,” those folks who are doing the most interesting and innovative work, have the least amount of privilege (and access to cultural capital). For more on the MLA controversy, see my previous post: tweeting your thesis? good. rethinking purpose of thesis? better. tweeting your thesis? good. rethinking purpose of thesis? better. Last week, some grad students at UCL’s Centre for Digital Humanities wanted to use twitter’s 140-character limit for learning how to concisely articulate and share one’s thesis statement/topic. So they created and started using the hashtag #tweetyourthesis. I was really excited to see this use of twitter; I developed some twitter assignments this semester for my students with the same goal–getting them to practice being concise–in mind. Two days after they first started using it (jan 11, 2012), Wired Campus at the Chronicle asked: You Can Tweet Your Thesis, But Should You? What does it mean if a student can condense an idea for such a long project into 140 characters? My immediate response to this question is: what does it mean if a student CAN’T condense an idea of such a long project into 140 characters? And another question: What’s the purpose of our ideas if we can’t communicate them in succinct, compelling ways? Just like the original tweeted question (twestion? tweequery? ), my two follow-ups are leading questions; they aren’t really questions intended to open up a discussion about how we should/shouldn’t use twitter in our academic work. Instead, they are posed with an understood response–What does it mean if a student can condense an idea in 140 characters? Implied response: Their thesis isn’t complex, rigorous, demanding, in-depth (fancy) enough. The counter–What does it mean if a student can’t condense? The implied response: Their thesis is too complex, too jargony, too esoteric. Either way you ask it, critical debates/conversations get hung up on questions of how best to develop and communicate a thesis and whether or not to use twitter in that process. While these are still important questions (and while I’m happy to have any conversations that take twitter seriously as medium of thoughtful and meaningful expression), they are not the questions that I want to pose and critically and creatively explore about graduate theses and online technologies like twitter (or blogs) right now. Why discuss whether or not twitter should be used? It is being used in productive, interesting and empowering ways. They are not questions that get at deeper concerns about how graduate departments can and should rethink the purpose and requirements of the thesis in light of the job market, the ridiculously long time that it takes to earn a doctorate (on average, 9 years), and the shifting ways and locations in which academic publishing is happening. [Kathleen Fitzpatrick] “It should be our jobs to support new kinds of work,” she said. And for faculty members trained before the digital era, she said that means a responsibility to “learn how to read in new formats,” not just to look for linear arguments over hundreds of pages. So true! It seems as if many writers/scholars fail to understand that writing online is much more than just putting something that you have written online; it requires developing new ways of connecting, collaborating, understanding, reflecting and communicating! Students AND faculty need to develop skills/ways of thinking and engaging and writing that the new online media demand. How can students be prepared for writing, researching and teaching in the 21st century without these important skills? They can’t. So, to wrap this entry (which was originally intended to be a brief discussion and archiving of the discussion about #tweetyourthesis), I thought I’d offer up my own twitter-worthy–it’s 58 characters!–thesis for this post (and a succinct summary of my thoughts on the topic): Tweeting your thesis? Good. Rethinking the purpose/requirements of thesis? Better. You can summarize your thesis in a tweet, but should you?